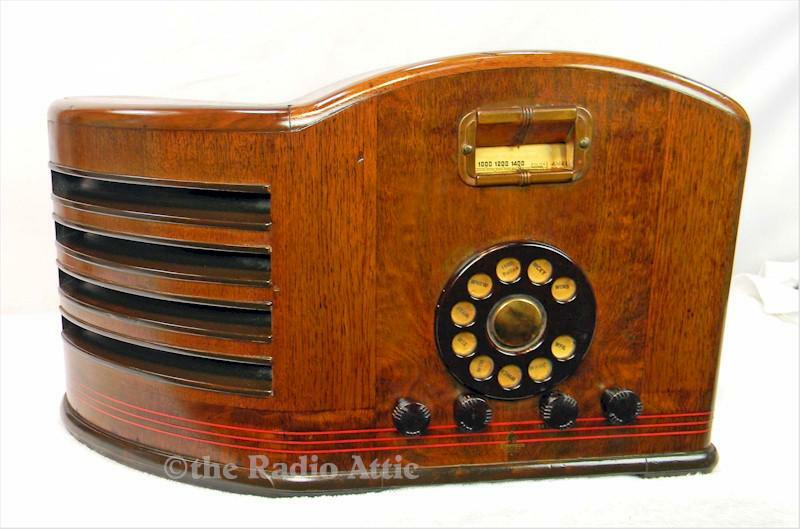 This is one of the most desired Ingraham Cabinet models in their noteworthy liaison with Emerson Radio. This model is highly unusual in form and sports the rage of the times "Teledial" tuning along with a more standard knob control. Contained within is a six-tube super-het chassis that offers both Broadcast and Shortwave. The radio has a two position tone control and a roll type of tuning dial. The cabinet is all original with only a tiny imperfection on the back lowest right corner. The finish is still terrific for the age and everything is factory installed. The radio has been professionally repaired and return to a like new condition. The radio plays extremely well and with an original speaker with one small repair which does not affect the sound quality. Take a good look at this set, as they are stunning and very rare…you will hard pressed to find another. There is a mini-jack installed for your connection of any modern device. This will allow your unlimited choice of content. Add a Bluetooth device for only $25! 18-1/2"W x 11-1/2"H x 10-3/4"D.
You are visitor number 847 to this page.